Confession, this was supposed to be a drip cake – that was my plan. After pouring the caramel, I decided otherwise and grabbed my offset spatula and run it around the cake. While doing so, I was thinking – why am I messing-up this nicely masked cake?! But I’m glad I did. I actually like how it gave the cake a bit of an edge and with the addition of the spun sugar gave it some drama. This was the first time I’ve made spun sugar. I only used sugar though – no glucose or corn syrup. I need to mention that the spun sugar only lasted for about three to four hours though. For the cake layers, I mixed things up a bit by making sponge cake this time. 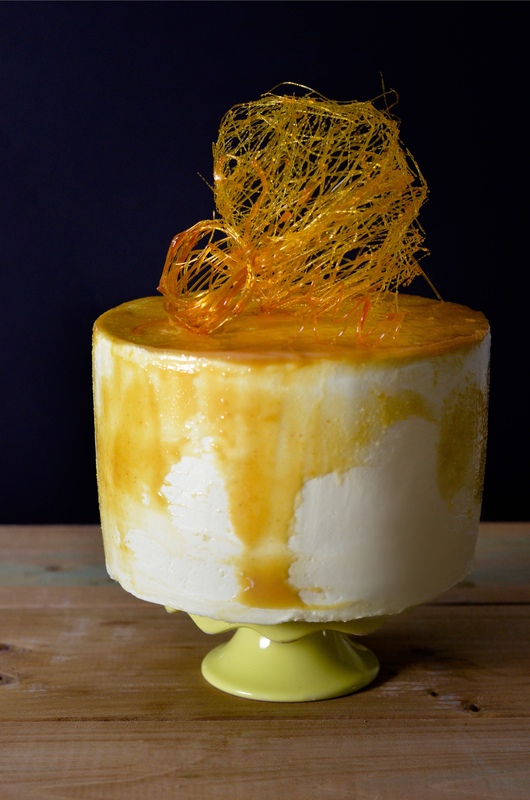 The structure of the cake is dependent on the egg foam, quite similar to chiffon cake. But for this recipe, the egg foam uses whole eggs that are warmed over hot water bath to achieve better volume. The dry ingredients is then added to the egg foam (whole eggs), which if under-folded it can leave lumps of flour, if over-folded the cake becomes tough and there’s a tendency to deflate the egg foam. It’s best to fold the flour in three additions for best results and as always, sift the flour. When you’re ready to try out making your Genoise sponge cake, the recipe is below. For the swiss buttercream, you can find recipe here. Line the bottom of your cake pans with parchment paper, do not oil and line the sides. The cake needs to cling on to the sides to properly form. Place the eggs, sugar and salt in a bowl (bowl of your stand mixer will do) and set it over the hot water bath and stir. The egg mixture needs to warm up to a temperature of about 43C/110F to achieve a better volume when beaten. Use the whip attachment and beat at high speed until light and thick. Add in vanilla while beating the eggs. Once the egg mixture is light and thick, take the bowl off the mixer and fold in the sifted flour and baking powder in 3 stages. Be careful not to overmix, this may cause the foam to deflate. After the flour has been incorporated, fold in the butter. Divide the batter into the 2 pans and bake at 350F for 20 - 25 minutes or until the cake tester comes out clean.